A bit sweet, a little sour and filled with probiotics, this is an authentic Russian soup to cool you down on those hot summer days. 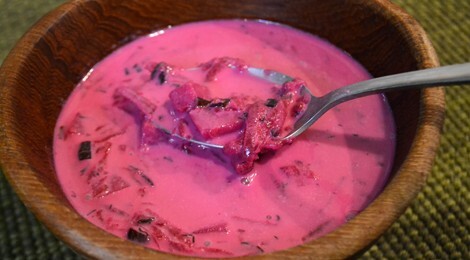 Wash your beets, and leaving skins on, boil for about 15-20 minutes or until fork is inserted easily. Let cool and remove skins. Shred your beets and add to a large serving bowl or pot. Add cooked potatoes, shredded cucumber, chopped onions, chopped dill, milk kefir, water, salt and sour cream and mix to incorporate flavor. Let mixture sit for a half hour, then add the garlic and more salt or sour cream if needed before serving. It should be a watery but creamy consistency. If your mixture is too sour or thin, add some more sour cream. Enjoy with bread or just as is.